DOWNTOWN IRONWOOD , SECOND FLOOR OF IRONWOOD MEMORIAL BUILDING. ELEVATOR NEXT TO PARKING LOT LOWER LEVEL. CLOSED TO THE PUBLIC 12PM TO 1PM DAILY. The Ironwood Social Security office is located in Ironwood 49938. The following page includes information for this location like the office phone number, hours of operation and driving directions. If you have any interests or comments about your retirement benefits or are interested in making an appointment, call the following Ironwood Social Security office. The Ironwood Social Security office is located at Ironwood 49938. The Michigan SSA regulates various federally run plans like retirement, SSI, Medicare and disability benefits. The following page contains helpful contact information for this location such as the Social Security office phone number, hours of operation, and driving directions. 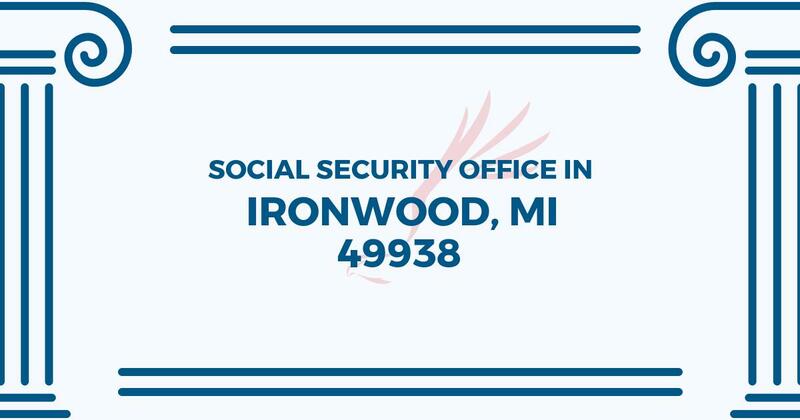 If you have any concerns or questions related to your retirement Social Security benefits or interested in scheduling an appointment, call the following Ironwood Social Security office.